Gail, Diane and Hart Kerbel grew up spending their weekends and summers at the family’s 100 acre cottage just outside Limehouse. The Kerbels bought the property back in 1973 and now along with Gail’s husband Charles, they visit the property as much as possible. 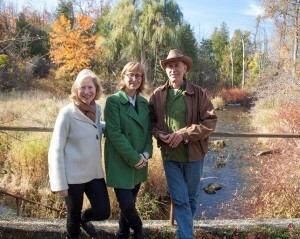 Gail, Diane and Hart fondly remember the large pond, a stone’s throw from the cottage. It was a source of endless fascination and enjoyment – big enough for floating about in search of fish and for skating during the cold winter months. The Kerbels had an online pond, located on a stream, built by dredging or damming the stream. Over the years, the family watched the pond slowly build up with silt, reducing water levels and filling with various plants. Eventually, they couldn’t enjoy the pond in the same way. Initially they considered having the pond dug out. This started with a visit to Credit Valley Conservation (CVC) for a permit. Through discussions with CVC staff, they learned that the pond wasn’t really as natural as they thought. The silt build up was actually a normal process of nature trying to return to its original state – a free flowing stream. In 2010, with the help of CVC and funding from the Ontario Ministry of Natural Resources and Forestry and Halton Peel Woodlands and Wildlife Stewardship, their dam was decommissioned and efforts were made to improve natural function in the stream. Discarded Christmas trees helped create a new bank channel and catch sediment flowing downstream. Shrubs and plants now grow on the new bank, making it stronger to direct the water to a more defined stream. Four years later, the Kerbels are very happy with their restoration project. The stream has re-established a beautiful narrow channel and there is lush regrowth of vegetation acting as a buffer along the bank. “It feels like a beautiful return to what was meant to be here” says Gail. “We’ve been so surprised by how much water rushes by.” Hart Kerbel is thrilled that the restored stream provides improved habitat for fish and other aquatic species. When asked if they miss the old pond, Charles says he misses the family shinny games in the winter, but it’s a loss they’re willing to take to restore their stream back to its original health.